As a young advocate in Los Angeles, I recognize how violence impacts family, school, and community dynamics. Much of the work I am committed to facilitating stems from my anger and frustration with the systems enabling my community to progress in healthy ways. My mission for this fellowship is to acknowledge intersectional issues by embracing social change through digital storytelling and actions in order to heal our communities from the cycles of violence and traumas. As a student at a continuation school, we were subjected to a culture of criminalization - student searches, excessive behavioral reports, name calling, threats of notifying probation officers, and lack of academic leadership etc. Nearly ten years later, I returned to this institution as a Teacher's Assistant and was saddened to see much of the same elements I experienced as a student were still there. However, I took this opportunity to build relationships with the youth in my community and learn how I can utilize my advocacy spirit to enrich their lives. Yet, through this process the youth contributed greatly to my personal healing journey as well as my professional leadership skills. Together, we created radical acts of tough love - traditions like watering our school plants, creating art for the hallways, collecting uneaten lunch fruit, reading stories out loud, and braiding each other’s hair! I need you to know that these were kids that were socially and institutionally marginalized and yet, when given the opportunity, they showed how compassionate, intelligent and artistic they really are! I am also a member of Trensitas NPP Youth Nights; a body positive program for teens of color. I was drawn into this collective after years of experiencing depression and anxiety associated with my body. Through Trensitas, I have the opportunity to collaborate with other local women who have experienced similar issues of eating disorders, and unhealthy body perceptions. The work Trensitas is committed to facilitating is extremely important since youth of color are subjected to mixed messages of how they “need” to look to be worthy of love and respect. Our program is school-based which allows us to infiltrate traditional learning spaces with culturally-infused workshops that promote self-love and self-healing. 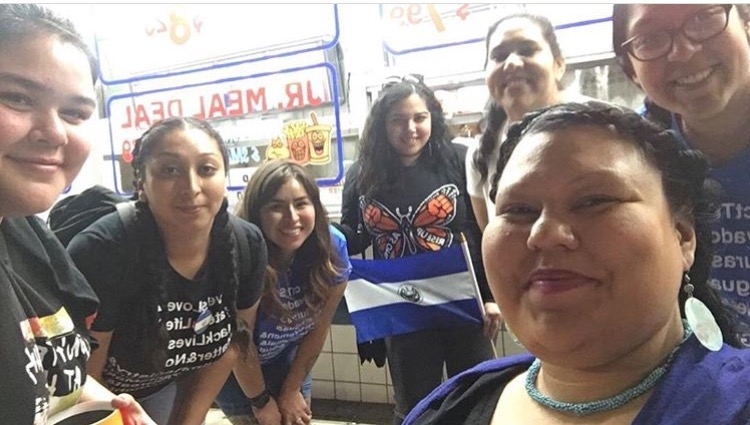 Recognizing the importance of establishing culturally-relevant and social justice informed media led me to join the Justice for My Sister Collective (JFMS). JFMS aims to build awareness of gender violence through storytelling and video production. The work JFMS is doing connects WOC, POC, LGBTIA and local teenagers with professionals in the media industry working to create progressive media that accurately reflects our communities. I enjoy working with JFMS as I have the opportunity to engage with members of a digital and local community on intersectional issues affecting our communities. As a grassroots advocate, I am comfortable working with collectives and community based organizations. I am often the person writing, organizing, taking photographs without individual recognition. I would like to broaden my presence by sharing my individual voice as a trustworthy community advocate. As a Wayfinder fellow I am driven to create more opportunities for my community to connect and heal from systematic, community, gender and youth violence. I plan to address these issues through a plan of action that entails digital multimedia and artist mobilizations. I would like to utilize digital storytelling as a tool of resistance, community empowerment and radical healing. One of my professional goals is to expand my advocacy to include future digital illustrations and digital zines for interactive art communications. I recognize the various ways our communities tell stories to survive and heal, and would like to continue to archive these sources on social media. Storytelling is essential to my projects as it will allow members of the community to participate in activities by sharing their own narratives and testimonies. Often times POC are conditioned to not share their experiences and truths. I want to challenge the dominant structure of community organizing by using indigenous methods for resistance, community empowerment and collective healing. I recently attended the Allied Media Conference in Detroit, Michigan. I was a presenter of a zine workshop titled “Using Zines to Center Native Peoples in Community Organizing”. As a workshop presenter, I have had the opportunity to practice facilitating and knowledge sharing in a friendly academic environment. Through this experience I realized the importance of providing educational opportunities for community building through the practice of storytelling. My current project is a bi-monthly digital zine focusing on the personal narratives of WOC, POC, trans and gender non-conforming folks. Sana Sana is currently accepting submissions for the first edition. All zines will be available for free on issuu.com. In addition, I am starting my digital illustration series with “#FamiliesNotDetentionCenters” to highlight the violence inflicted on immigrant families by Immigrations Enforcement Customs and America’s immigration policies. The work I aim to create through this fellowship will address the on-coming issues impacting communities of color. I want my advocacy work to reflect the hardships and the resiliency of the people. Therefore, I am committed to implementing social change through art education, media literacy, and community healing.